In October, 1975 Peoria’s three hospitals, Methodist Medical Center, OSF Saint Francis Medical Center and Proctor Community Hospital decided to merge the two hospital-owned ambulance companies into one company, a not-for-profit corporation providing care for all hospital patients as well as “911” services to the City. The hospital leadership resolved to cooperate for the betterment of the community and this legacy of cooperation is stronger today than ever. The company’s name was changed from Green Cross and Ace Ambulance to Peoria Hospitals’ Mobile Medical Service in January 1978. The company, known as Mobile Medic operated in Peoria, Bartonville and Dunlap until the governing Board decided to pursue higher performance strategies in EMS System design. Advanced Medical Transport of Central Illinois (now generally referred as AMT) was established in September of 1991 following the Board’s desire to modernize the EMS system for the future and to work to make the organization self-sustaining and best-in- class. AMT deployed as a high performance, full service, all advanced life support program in the fall of 1991. Merging all of the ambulance services together, AMT put a paramedic on every ambulance, responded paramedics to every call and deployed resources based on time of day and day of week studies of ambulance demand. The company unbolted the crews from buildings and stationed the ambulances across the community for faster response. Using protocols to triage life threatening calls from non-life threatening events, AMT achieved nationally accepted response time standards in the first year following redeployment and has continued this practice ever since. is the largest and most successful joint effort of the central Illinois medical community and is poised to further our tradition of good governance, professional achievement and service to the community. A first-of-its-kind Critical Care Paramedic Transport Program was developed in 1992 to meet the needs of smaller communities. Classes were offered to all EMT-paramedic personnel and in June of 1993 AMT began to provide Critical Care Transport services to assist in the transfer of critically ill patients across the region. Soon, AMT had achieved a well-regarded national reputation in the EMS community for quality, design and achievement. Since then, AMT has presented company accomplishments, including leadership presentations at national conferences and is regarded as a national model for not-for-profit EMS. As service and patient transport volumes increased, the business grew and AMT’s physical facility became increasingly unusable given the changing complexity of the organization. In November of 1995 AMT moved from 8202 N. University to a specially designed 30,000 square foot facility at 1718 N. Sterling Avenue. Today, this facility has been enlarged to 50,000 square feet and serves as the corporation’s headquarters. From 1992-1995, AMT acquired several area ambulance companies to better serve the needs of our customers and communities. These acquisitions were well supported by our community Board of Directors and continue to serve the needs of central Illinois. To meet the ever growing needs of the company, a 2001 decision to charter the company’s Training and Research Institute gave rise to a 6000 square foot education center with modern classrooms and high tech training systems. Initially, classes taught were for basic and intermediate emergency medical technicians. In 2003 regulators approved AMT to host and sponsor its own paramedic class. To date, AMT is the largest non-collegiate resource for EMS education in downstate Illinois and will host an accredited program in the fall 2013. The Board of Directors decided in 2001 to focus on the community again when it committed to a grant program to fund automated external defibrillators, or AED’s. AMT founded its very own internally funded AED grant program, dubbed “CardioReviver”, is a public access program designed to save lives by making life-saving equipment and training readily available to the public. Since inception, the company has placed 500 AED’s in the community and trained 20,000 citizens in CPR and AED use completely funded by AMT at a cost of over $1,000,000. Advanced Medical Transport also undertook the rigorous task of becoming Illinois first and only nationally accredited ambulance service. 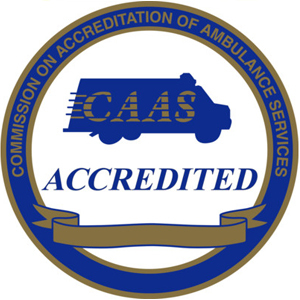 AMT received a prestigious three-year accreditation achieving a perfect score during the 2001 site visit by the Commission on Accreditation of Ambulance Services (CAAS). Since then, AMT has successfully achieved CAAS reaccreditation in 2005, 2008 and 2011 each time earning high praise from the reviewers and a commitment to develop our high quality standards. New business opportunities continue to advance the company. In October 2003, AMT expanded again by providing paramedic services to four fire protection districts located in Mercer County, Illinois. In August 2004, AMT acquired the hospital’s ambulance company and became the paramedic service provider for Streator, Illinois and the surrounding rural areas. AMT diversified its services when asked to leverage our core competencies in EMS. By expanding into operations management in 2005, AMT began providing intellectual and turn-around service to Area Ambulance Service in Cedar Rapids, Iowa. The contract, now in its eighth year has led to the successful redevelopment of Iowa’s highly regarded, full service paramedic services provider. Area Ambulance Service recently designed and constructed a new facility which boasts Iowa’s most modern EMS facility constructed to date. In January of 2007, the Peoria City Council approved a Franchise Agreement between the City of Peoria and Advanced Medical Transport. The 20-year agreement serves to align AMT and the interests of the City of Peoria, The Peoria Fire Department and the Peoria Fire Fighters Local 50 in providing the highest quality emergency medical service to the citizens. AMT and the Peoria Fire Department work jointly on several projects, including firefighter education, as AMT provides paramedic certification training to the Department’s firefighters every year. In 2008, AMT and the State of Illinois assessed the potential methods and transportation coordination of patients with behavioral health needs. AMT was awarded by the State an exclusive contract to provide coordinated transportation services for involuntary mental health admissions in November of 2009 and in January of 2010 Illinois Patient Transport began operations. Each year, AMT provides quality service to clients needing care across the State of Illinois. In 2008, AMT of Central Illinois, the Peoria-based ambulance provider, created a new parent organization, AMT Incorporated, to govern the growing needs of the enterprise. AMT Incorporated formed MEMSI, a small corporation to manage the Cedar Rapids service agreements and to pursue other business opportunities. In 2011, AMT Incorporated created Advanced Medical Transport of Iowa. The new company was established as a not-for-profit affiliate and was chartered to operate a new ambulance service in Iowa City, Iowa. Governed by a local, Iowa-based community Board of Directors, the enterprise provides regional and local paramedic services in southeastern Iowa and is the hub for AMT of Iowa’s operations, which now include the Iowa Quad Cities. In January of 2013, Trinity Medical Center in Rock Island, Illinois merged their assets into AMT of Central Illinois. The purpose of this merged entity was to create a comprehensive ambulance and transportation service model for Trinity’s four-hospital campus in the Illinois and Iowa Quad Cities. AMT of Central Illinois and Trinity EMS together now provide high performance services in the Quad Cities. Poised for additional growth in service lines and opportunity, AMT has earned the trust and respect of two major regional healthcare systems. As our organization continues to grow, increased emphasis was placed on safety, clinical quality and effectiveness is served with the appointment of a standing AMT Medical Quality Improvement Committee in 2012. In addition, the company added Dr. George Hevesy to the parent company Board of Directors to provide professional advice and perspective on medical quality of care and emerging issues. Patient-centered, clinically effective, community focused; AMT Incorporated will continue to use its community assets to develop innovative and financially sound solutions to serve our clients. Pre-hospital emergency medicine will undergo an evolution with health care reform as a key driver. AMT, and our related organizations, will continue to be an essential element of successful community healthcare systems.